Today is a crucial moment in the life of Mr.O. Today is the day he has Two weeks ago he decided to become a baker and baked his first sweet goodness, Banana Bread, which I thought would be the easiest and useful, and yes, delicious. I almost gave up teaching him when he started to put all the ingredients I laid down on the kitchen bench into the mixing bowl without thinking. Oh, dear…trying to be calm and patient, I gave him a quick run-down on the basic rules of baking: creaming, sifting, measurement, etc. “Geez, it’s a lot more complicated than I thought.” said he. I said to myself, “So, think of the hard work that goes into the goodness next week you bite into it, let alone the amount of sugar!”. I didn’t worry that much really because no one can fail with banana bread. The recipe I used was my old tried and true recipe I had established through trials and errors, but I simplified it for a beginner, which I realised gave a much better result than my old one. In cooking, there is always a space for change and improvement. Or maybe my taste changes depending on when and where. The new recipe contains wholewheat, yogurt, butter, brown sugar; no nuts. I snack on walnuts, almonds and hazelnuts every day here and that is why I aimed for soft-textured and 100% pure banana flavour and it worked brilliantly. I will stick to this banana-only recipe from now on. 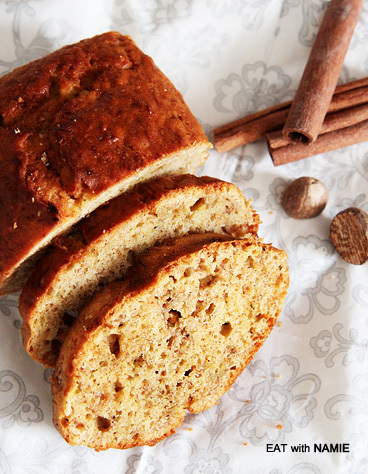 I also prefer my banana bread with cinnamon and nutmeg instead of vanilla. As you noticed, the bread is in an oval shape because I used a baking tin for Turkish dessert. It is also longer than a loaf pan so the bread isn’t as all as it should be, which isn’t a major issue. I am good at adapting and improvising after years of living in a foreign country. 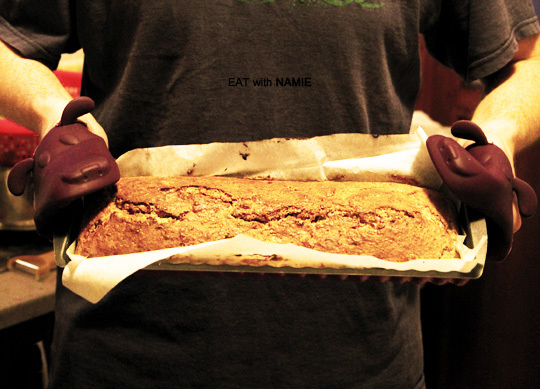 Mr.O is proudly posing with his first baking. His next challenge will be chocolate brownies, which is another easy classic. Here is a recipe for those who want to live simply without much fuss like me. 1. Preheat the oven to 350°F (175°C) and line a 4×8 loaf pan. 3. Whisk eggs one at a time and mix in yogurt. 3. Mix in the banana and dry ingredients. 4. Pour the mixture into the pan and bake for 45 mins. Cool on a rack. * Serving: Slightly toast and serve with butter and honey or yogurt for complete breakfast or a snack. 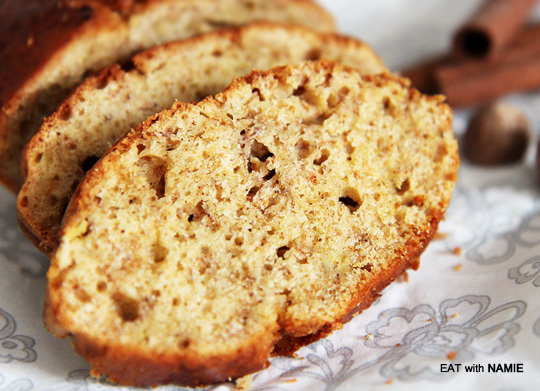 Check out this page for more ideas for banana bread. 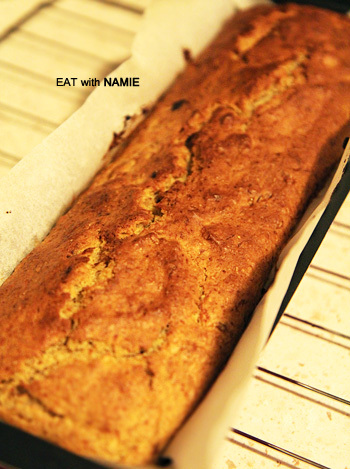 lovely banana bread, it looks really soft and airy ^^ btw I love the baking story of Mr.O, can’t wait to see your next post when he will make chocolate brownies ! !